Did you know that owning a pet can improve our health? So why not return the favor and learn pet CPR so you know what to do if an emergency arises. Our pets are considered members of the family and they enrich our lives in more ways than we can count. In turn, they depend on us for their safety and well-being. For your pet, there is no 911 response system, so it is very important that you and members of your family are trained to save your pet’s life, until you can get him or her to an emergency pet hospital. 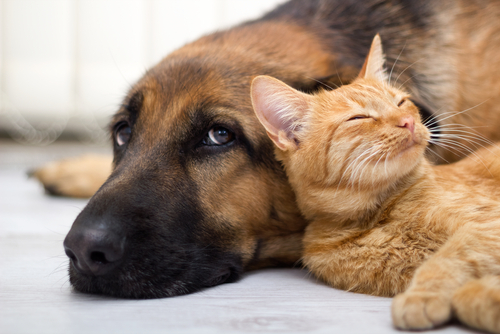 CPR stands for ‘cardiopulmonary resuscitation’ and is a life-saving procedure used to help dogs and cats that stopped breathing and/or have no heartbeat. CPR preserves brain function until proper blood circulation and breathing can be restored. The CPR process is similar to that of a human, but you want to make sure they are on laying on the their side. Step 1: Check to see if the animal is breathing – look at its chest, listen for breathing, feel for breaths with the back of your hand. Step 2: If the animal is not breathing, open their airway by tilting its head back a little bit and pulling on the tongue. Then give it 4-5 breaths by covering its nose with your mouth and forcefully blowing until you see the chest rise, and removing your mouth when the chest has fully expanded. After several breaths, stop and check for breathing and a pulse. Step 3: Check for a pulse. On larger animals, place your fingers on the inside of the rear leg, towards the top of the thigh. On small dogs and cats, place your fingers on the chest just behind the shoulder. If there is a pulse but the animal is still not breathing, continue breathing for it, mouth-to-snout. Give 1 breath every 3 seconds, or for cats and small dogs give 1 breath every 2 seconds. Push down on the stomach area every few seconds to help expel the air that may have accumulated there. Continue rescue breathing until you can get the animal to the nearest veterinary facility. Step 4: If there is no pulse, begin chest compressions. In small dogs and cats, place the animal on the ground, and then sandwich the chest with your hands on either side, right behind the shoulder blades. Squeeze the chest, compressing it about ½ to 1 inch deep. Do this 100-150 times per minute. In a larger dog, place it on its right side and put your hands on the widest part of the chest. Depress the rib cage 1 ½ to 4 inches, depending on the dog’s size. Do this 80 to 120 times per minute. After one minute check for a pulse. If no response, then repeat chest compressions. If possible, give breaths during the compressions. If this is not possible, give 2 breaths after every 12 compressions. If two people are working together, then have the second person give a breath during every second or third compression. Continue CPR until you can get the animal to a veterinary facility. Below is another helpful video on performing CPR on dogs. Note: This instructional video recommends a compression to ventilation ratio of 15 compressions followed by 1 breath. The above protocol can also be found at VeterinaryPartner.com. You can print the article by going to www.veterinarypartner.com/Content.plx?P=Print&A=294. Taking a pet first aid course is highly recommended. The American Red Cross offers such courses – see their website at www.redcross.org/services/hss/courses/pets.html.